Some bathrooms are luxurious and spacious… and some are not. 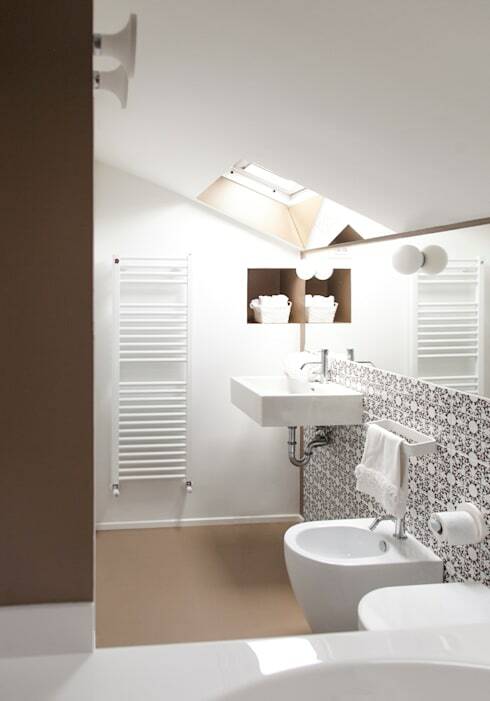 But that's not to say that a tiny bathroom can't be just as stylish as its larger counterparts. If you're looking at a tiny bathroom, there are several decorating tricks you can use to make your space as convenient, clean, and comfortable as possible. Many interior designers use these techniques when planning a layout of a smaller room – they focus on light, balance, distribution, and the creation of a cohesive space, no matter its size. If your tiny bathroom is in need of an upgrade, read on! You may have more space than you think. In a room with limited floorspace, you'll want to take advantage of every last inch of space that's available. When there are too many items on the floor, the space begins to feel bottom-heavy and weighed down, not to mention it's difficult to find space for moving around. If you've got a standing toilet paper holder, consider upgrading to one that's mounted beside the sink. If there's a bathroom scale hanging out in the corner of the floor, find a spot where you can store it out of the way. Looking at a basket full of hair accessories, or a stack of magazines? Your best bet is to invest in a small cupboard or shelf that you can mount above the toilet – there's often unused space hanging out up there, so take advantage of it! Give yourself the freedom to roam the floors of your tiny bathroom, clutter-free. Any interior design professional will tell you that light is one of the make-or-break elements of designing a room. Light leads our eyes around the space, allowing us to see the full dimensions of its boundaries, and it also creates a mood in the space, from romantic and calm to energetic and refreshing. 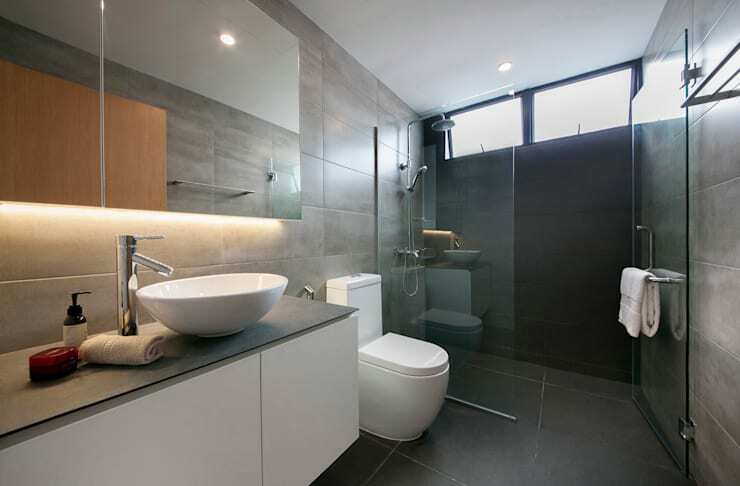 A small bathroom can tend to feel dark and cramped, so focus on creating as much light as possible in order to refresh the space and show off its dimensions. This example uses light coloured paint on the ceilings, as well as a light wood floor and all-white appliances. That's not to say that they didn't get a little creative with the patterned tile on the wall, but even the tile has a lustrous, metallic sheen to it that helps reflect light. What's more, the ceiling window is undressed, allowing maximum light to fill the space. If you're facing a bathroom with no access to natural light, consider installing a few extra lamps or bulbs in strategic locations – you'll want a balance of illumination throughout the room that leads your eyes to the far and high corners of the space, not just the central areas. A tiny bathroom has the tendency to look overwhelmed by stuff. Keep your focus on the addition of pops of colour, and you'll avoid creating an overwhelming wave of decor that meets your eyes when you enter! One way to do this is to simplify your bathroom – first, decide what you truly need and what you don't (lookin' at you, old lipstick tubes). Then, take some time to haul everything out of the bathroom, from linens to potted plants to the bathroom scale. One by one, replace the items, and pay attention to the point when it starts feeling full. Focus on aesthetics – even if you need more items, you can always find a convenient way to store them so that they're not visually cluttering your space. Another technique for giving your room pops of colour that coordinate (as this example does) is to run to the nearest craft store and pick up a tube of paint. Painting your objects in a matching color will create a more cohesive theme that carries your eyes throughout the space seamlessly. Small bathrooms may lack space, but there's something to be said for the cozy, comforting, and quaint charm of a tiny bathroom. Keep this in mind as you decorate, and find decor whose colours and style match the cozy dimensions and layout of your space. 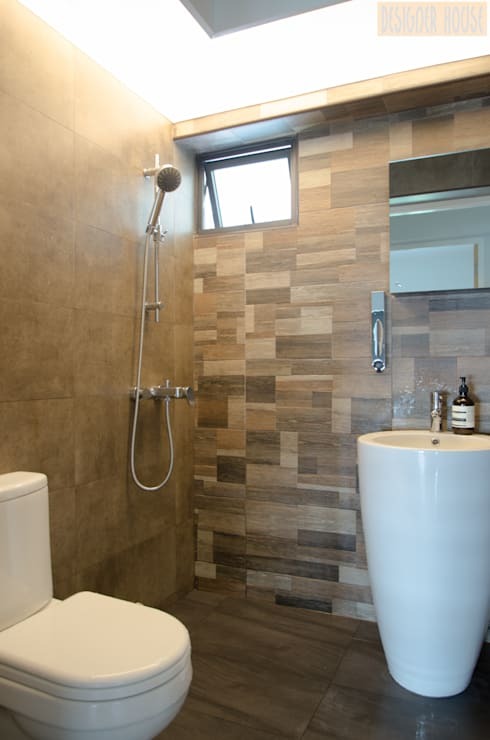 Tiny bathrooms can also be luxurious bathrooms, thanks to the invention of the bathroom tile. Covering your bathroom in shower tiles, as this bathroom shows, turns even the smallest of bathrooms into a lustrous, luxurious space. 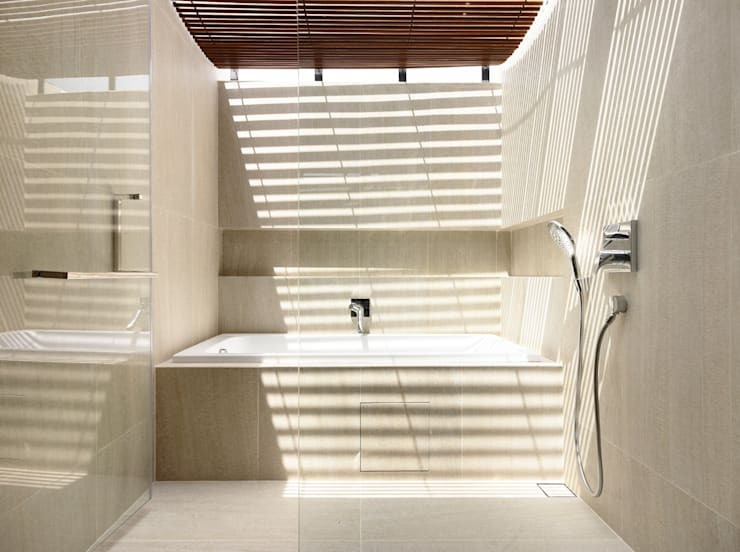 The tile in this example also lends a certain minimalist feel, as the walls are decorated only by a niche shelf and the shadows that play on the creamy walls. There's another perk to adding shower tile beyond its luxurious appeal – adding tiles everywhere enables you to place a shower head wherever you like! This means that you can place a shower in a space where a full standing shower wouldn't fit otherwise. This bathroom does an excellent job of fitting in a shower smack dab in the center of the room, sans shower stall and shower curtain. In a bathroom with a limited amount of space, this design does away with several bulky elements of a shower, creating the most streamline layout possible. If you're feeling inspired by this stylish walk-up shower, have a look at the 10 ideas for walk-in showers featured in this ideabook. Mirrors are an excellent feature for small rooms. They provide depth, they reflect light, and they add visual interest without the bulkiness that comes with other decor like potted plants, vases, etc. 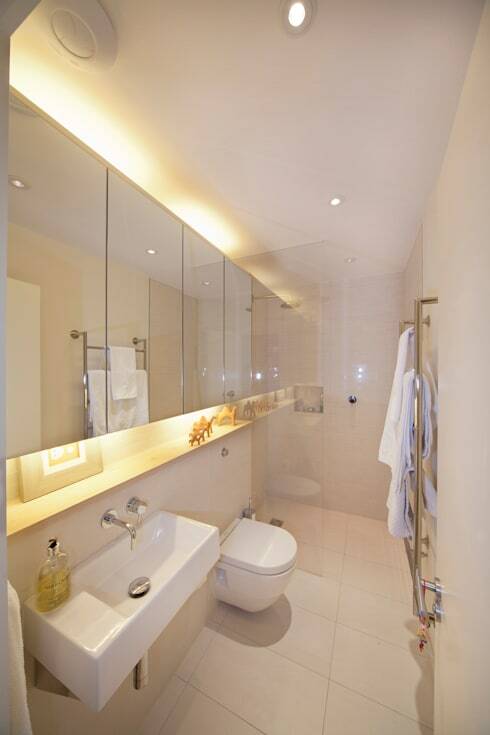 In this example, mirrors have been installed along an entire wall, creating the illusion that the bathroom is wider than it actually is. The mirrors also house cabinets – a convenient storage feature for such a small space. However, you don't have to line your entire room with mirrors in order to create a reflective space! You can experiment with just two or three mirrors – as you place them at different heights and angles around the room, focus on where light is being reflected and try to maximize the amount you can see bouncing around the room. If you have an outside window, a good rule of thumb is to place a mirror opposite the window so that the light enters and rebounds off the mirror to reach the far corners of the room. Hopefully, this list of tips has shown you that even the smallest of bathrooms has the potential to be well-designs, comfortable, stylish, and clutter-free! If you're feeling inspired to give your tiny spaces a second chance at life, have a look at this ideabook featuring a collection of 9 little kitchens that are positively delightful despite their small size. What do you think of this bathroom inspiration? Share your insight below.